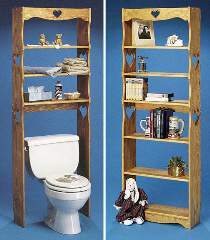 Country display shelves or bathroom space saver, this plan shows you how to build both projects. Shelves have ample space for almost anything. Bathroom version utilizes otherwise wasted space over the toilet. Plan details for all scroll work are drawn FULL SIZE. Measures 72"H x 25-1/2"W x 9"D.